HALIFAX -- Nova Scotia Premier Stephen McNeil says a "national conversation" on autism is needed, but the province must examine existing programs to provide additional support for families who need help. 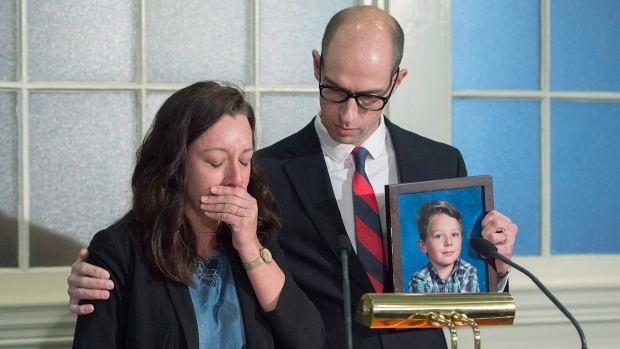 McNeil reacted Thursday to questions about Carly and John Sutherland, a Halifax-area couple who say there is a lack of supports and programs to help with their nine-year-old son Callum, who struggles with a type of autism that results in violent outbursts. While not directly addressing the Sutherlands' concerns, McNeil said the government needs to respond in "acute" situations. As an example, he said it may not be appropriate in some cases to have a means test for programs such as respite care. "Potentially the issue is about how do we provide the supports to make sure there is respite care available for them with a support network. If it is about money then we have to look at how we do that, so that will be an ongoing conversation that will take place." On Monday, Carly Sutherland said the province had increased her family's respite funding through its income-based program. An average family could receive up to $3,800 per month for exceptional needs, according to the province. Sutherland said while she was appreciative of the extra support, what's really required is a "needs based" service, noting that her family is left to hire, train, and schedule staff to be in her home to support Callum. The family's plight saw Autism Canada and the Canadian Autism Spectrum Disorder Alliance renew calls for a national strategy, saying Callum's case illustrates what happens when families can't get crisis assistance. McNeil didn't call outright for a strategy, but said there are issues that have to be addressed with federal officials. Still, he said the immediate responsibility lies with the province. "If it is about not having the support or finding the appropriate people with the skill to be able to provide the service, then I think we need to deal with that at the same time we are talking with Ottawa about how we fund many of these (programs) that would be national programs," he said. Nova Scotia's Health Department said it is spending about $15.7 million on autism services in the province this year. The figure includes $300,000 for Autism Nova Scotia to expand resource centres, particularly in rural areas. There is also $500,000 for an early intervention pilot program to help parents before their children go into the pre-school Early Intensive Behavioural Intervention program. In an interview this week, Health Minister Randy Delorey said the range of conditions and individual needs on the autism spectrum make for challenges when it comes to funding specific needs. "I think it does sometime take time to get the right balance (of supports) for individuals, particularly for those individuals on the upper end of the spectrum," he said. "Individuals do come together across (government) departments to try to find the right solution, working with the families to do that."